Certified Automotive Repair gets you back on the road with safe and reliable brakes, guaranteed. How long has it been since you had your brakes checked? Every six months, it’s always a good idea to have your brakes checked and your tires rotated. 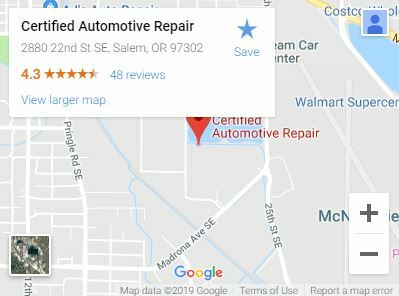 Our friendly mechanics at Certified Automotive Repair will give your car or truck a full brake inspection and brake service for Salem, Oregon customers. If your brakes are working well, we will be honest about it–we don’t pressure you into making unnecessary repairs. But if any component of your brake system is amiss, we will provide a free and detailed estimate, plus we’ll answer every question you may have. Our goal is to get you back on the road with satisfaction and safety. Maybe, maybe not? Find out at Certified Automotive! Brakes should always be performing safely and properly. If your brakes have been acting up, or you would like a routine assessment, take your vehicle to Certified Automotive Repair today. There are plenty of ways to tell if your brakes are performing adequately or not. However, delaying to have your brakes serviced, checked, or replaced could have catastrophic consequences down the road. Also, see us for Timing Belts, Tune Ups, Transmission Services, and all other automotive service needs.